She's been wearing a cast for the last month after breaking her arm. But Suri isn't letting a broken arm get in the way of her enjoying herself, as she proved by riding a scooter home to school in NYC on October 8th 2013. 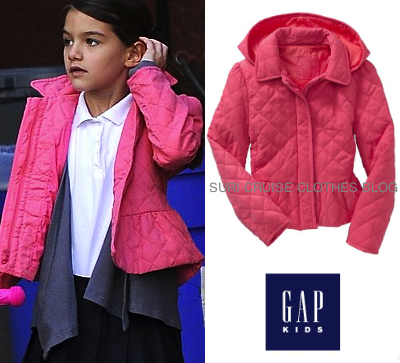 Suri is wearing Quilted peplum coat in sugar coral ($44.95) by Gap Kids. with Blue Wool Flannel Pleated skirt ($375) by Gucci Kids.